Due to ongoing maintenance work within the main St Peter's Cathedral space, this year's Cathedral art event is taking on a somewhat different look. Organisers were challenged to rethink how they would proceed with this year's event and the fruit of their discussions will see a one-night event take place in the Cynthia Poulton Hall on the Cathedral site, Friday 26 October. 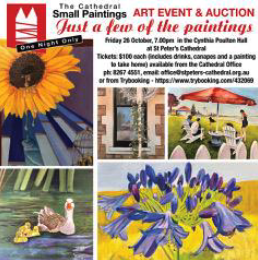 Promotional material for the event says, "This promises to be a wonderful and memorable event which, thanks to the generosity of the Adelaide Art Community, will ensure that everyone who attends will not only enjoy food, wine and good company but will also take a painting home with them." "The proceeds from the evening will go to supporting the magnificent St Peter’s Organ restoration project that is now nearing completion. Your contribution to the superb and newly restored organ will help to make sure it remains at the heart of the Cathedral’s and Adelaide’s creative and musical life for generations to come." Artists have donated small-format pieces which each person attending will choose and take home. Attendees will receive a number upon entry and these will be drawn throughout the night, at which point the holder of the corresponding number will choose their artwork from the remaining pieces. There will also be a live auction taking place, with six large-format pieces going under the hammer. Good food and wine will be served throughout the night.